The Vanguard 600� is an economical industrial Ethernet router designed with a sleek compact form factor to provide reliable, secure cellular backhaul for enterprise solutions, smart infrastructure connectivity or fixed remote site applications requiring reliable primary, temporary or back up internet connectivity. The Vanguard 600� combines next generation 4G LTE CAT-1 cellular technology with 3G fallback for reliable and future-proof fixed asset monitoring and control. 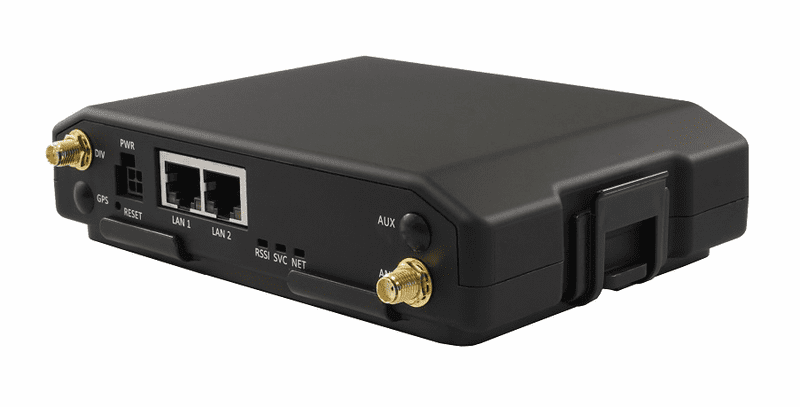 This ready-to-deploy broadband router enables wireless data connectivity for two LAN ports over public cellular networks at 4G speeds with strong, Enterprise-grade security (IPSec, VPN, WPA-2) to protect against external threats. The Vanguard 600� seamlessly integrates with DeviceOutlook�, CalAmp�s cloudbased enterprise-grade device management and control application, which supports over-the-air deployments and automated provisioning of custom configurations when devices initially connect to the network. Included with the Vanguard 600� is CalAmp�s Open Developer Platform (ODP) allowing customers to build intelligence into the Vanguard to support custom markets and application specific needs. The combination of ODP and Device Outlook, provide a simple to install and easy to manage connectivity solution which provides reliable connectivity for critical assets, Smart Cities infrastructure and any other Ethernet enabled device. This single, flexible platform addresses a variety of wireless communications needs with secure, over-the-air configuration and system monitoring to reduce operating and support costs.